In 3-quart saucepan, heat 6 cups water to boiling over high heat. Add beans to boiling water. Cook 4 to 6 minutes or until crisp-tender; drain. Rinse with cold water; drain. Cover; refrigerate while making dip. In medium bowl, beat remaining ingredients except peanuts with wire whisk until smooth. Cover; refrigerate at least 30 minutes to blend flavors. Stir before serving. Garnish with peanuts. 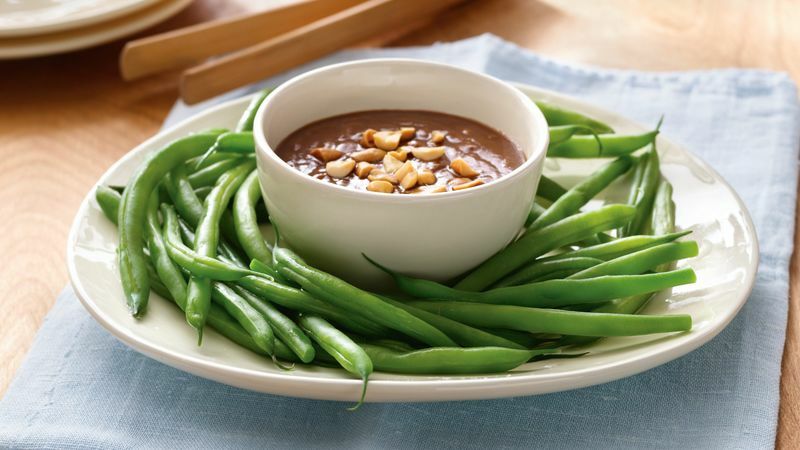 Serve beans with dip. Fresh gingerroot resembles a gnarled tan-colored root. It adds a distinctive pungency and aroma to foods and is used extensively in dishes of the Far East. To prepare, use a small sharp knife to peel the tough skin and then finely chop the gingerroot into pieces. Cooking the beans in boiling water and then rinsing them in cold water will bring out their bright color.